After cruising northern New England for a long time, Kay Harrison and I sailed down the Intracoastal Waterway (“ICW”) to Fort Lauderdale on Catmandu, our Catalina 27. We have cruised here for two summers so far. I have found there are huge differences between cruising up north and cruising south Florida. Here are my top three lessons learned. 1. Lightning! Florida is the lightning capital of the US, which I knew before I arrived. More people are killed by lightning in Florida than any other state. Now consider that the sport of sailing involves traveling along a very flat part of the country under a very tall metal pole, and one could reasonably conclude that sailors are just asking to get hit by lightning. We had bad thunderstorms back in New England as well, but there were reliable ways to determine if a thunderstorm is headed your way. Checking the weather radar on a smart phone is the best way, since everyone knows which direction the weather comes from and it is easy to see if you are in its path. 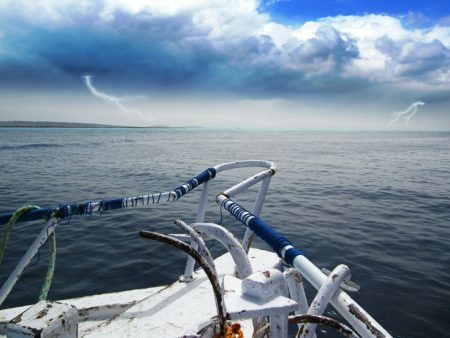 Another way is that the National Weather Service would send an alert that causes an alarm on the boat’s VHF radio which would then tune the radio to its thunderstorm warning on the WX channel. Also, in the old days, one could also turn on an AM radio and listen for crackling sounds that indicate lightning. Things are different in Florida. In Florida, thunderstorms don’t just travel down to you from upwind in a predictable way like they do in New England. There is so much heat and moisture and energy in the atmosphere that thunderstorms actually form and grow over your head while you are sailing. Several times I have waited in port for a storm to pass, only to have another one sprout and emerge fully grown right on top of me. I have experienced many close calls of lightning strikes very close to me, but luckily I have never been hit. What should one do to avoid being hit by lightning, or to survive being hit? I do not have the definitive answer, but I have some common sense practices, and have done some research that I try to follow on my boat. My first strategy is the “buddy system.” If I cannot get into port right away, travel with or anchor near a boat with a taller mast. My other strategy that I learned from online research is to go below, unplug all the antennae and electronic devices you can, and avoid metal objects by staying in the middle of the cabin. 2. Bring your own pump-out adapter. Most cruising sailboats have a holding tank that should be pumped out regularly. Pump-out facilities at most marinas on the East Coast provide a hose that has a cone fitting at the end of their hose that will fit almost any size of deck fitting on a boat. But not in Florida. We have been pumped out at many different marinas, and most of them in Florida have no adapter at all at the end of their hose, and they expect boaters to provide their own. Since I did not have one when I arrived, I would have to improvise by making a cone out of neoprene or whatever material I have on hand and will not want to use again. I mean, when you gotta go, you gotta go! 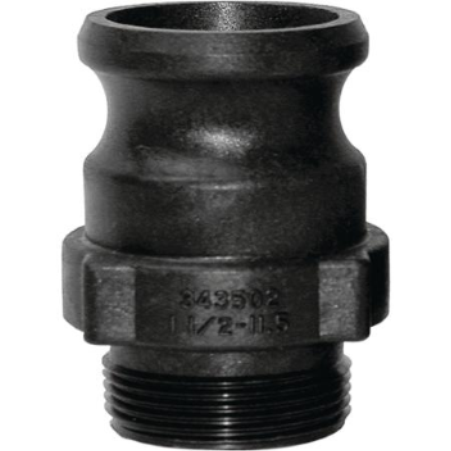 I shopped around and could not find the 1.5 inch diameter adapter that fits my deck fitting at West Marine, Sailorman, Defender, or other retailers. I got mine at the Walmart RV Department, and I treat it like treasure. 3. You cannot get block ice in South Florida. People, if there is one thing South Florida marinas and grocery stores could learn from the rest of the country, it is that block ice lasts a lot longer than cubes. Like most boats the size of Catmandu, we have an ice box and do not have powered refrigeration. Up north, we would get a block of ice and a bag of cubes every two or three days, which would be entirely sufficient. One cannot get block ice in South Florida, and a bag of ice cubes lasts less than a day in the Florida summer heat. I have given up searching, and have resorted to making my own block ice. I bought plastic storage bins and make ice blocks with them in my freezer at home. I have to start freezing them about a week before a cruise.